FRIDAY!!!!!!!!!!!! OK sorry about that but I am just so glad to make it here. This week I have been working at a Day Camp with my Church. For this week I was the adult leader of the Razzle Frazzle team. Over all we had 80 different children come through the camp, the most ever. It has been a hot and tiresome week, but I loved every minute of it. So I am sitting here relaxing on a Friday night and I realized that I hadn't put of the this weeks Flashback. So there may not be as much to read this week, but in honor of being worn out, there will be more pictures. Over the last couple of days I have seen some of these gems popping up on eBay. 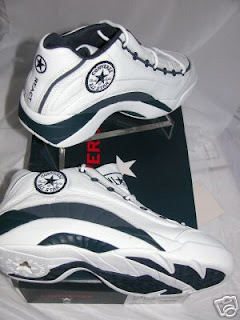 Much like the last Flashback these shoes released soon after the All Star 2000 and the reintroduction of the Chuck Taylor Patch. 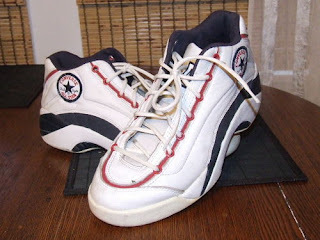 The Converse A/S Desire also featured the Plane Circle and Star logo, much like the current Converse Logo. 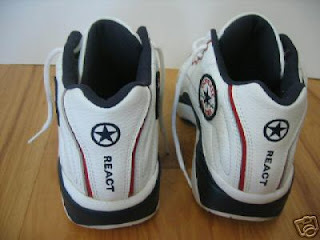 They also feature React in the heel, which you can see so prominently displayed below. 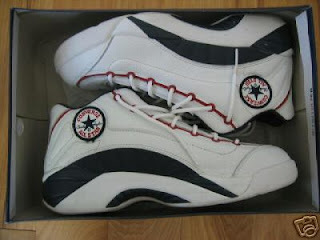 I believe that these released in 1997 and came in at least three colorways. White/Red/Navy, White/Navy, and Black/White. 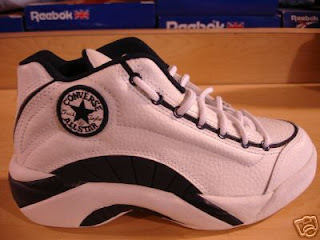 Unlike last the Converse Springfield, I actually had this pair of shoes. Unfortunately my pair is completely trashed. I remember trying to sell one of my friends on these shoes but he went with the Converse Dr.J 2000, a shoe that will be covered soon. Below are some more pictures in the classic White/Red/Navy and the White/Navy colorways. All of these pictures came from eBay. Thanks for reading and please post your comments. If there is a shoe you would like to see? Any suggestions on improvements or anything else please let me know. Thanks and enjoy your weekend.